JHB students were so fortunate to have the opportunity to participate in three after-school activities during the month of March. Physical Education teacher, Nate Quirion, offered his Intramural Club for six weeks to fourth and fifth graders. 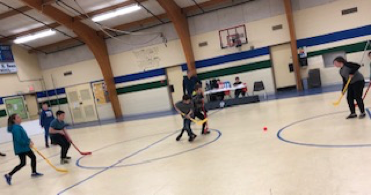 Forty-three students participated in three weeks of basketball and three weeks of floor hockey. Sadie LaJoie, parent of third-grader Natalie Buntin, has volunteered her time offering Dance Club to all students K-5 for the past six weeks. Thirty-three students learned and practiced the basics of ballet, tap, and jazz for an hour each week. The club was offered on Monday, Wednesday, and Friday. Music teacher, Sue Paradis, has organized a Ukulele Club that meets once a week. JHB was the lucky recipient of a grant that afforded the school with a class set of ukuleles. The number of students participating in this club varies from week to week, as students can choose to take part in this club during after-school recess and are still able to take the buses home.